I love easy sweet treats that are at the most 4 ingredients. 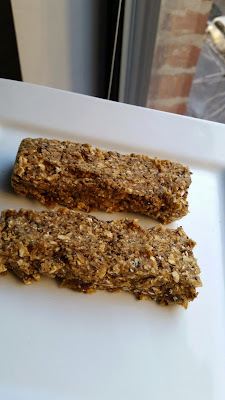 I was thinking about making my energy bars all week but haven't had time so I thought why not dedicate this post to them. When you're making raw desserts such as pies or truffles, the base is almost always nuts and a dried fruit. The dried fruit makes the mixture sticky and provides a cohesive force that holds it all together. Since some people are allergic to nuts, you can use rolled oats and dried fruit. The dried fruit I usually use are medjool dates but lately I'm also obsessed with dried apricots and dried pitted prunes. So, for your base, use a nut of your choice and dried fruit OR rolled oats and dried fruit. You can also throw in chia seeds or flaxseed meal. It's best to use a food processor for these treats; you may also need coconut oil or just water to keep your processor going. The dried fruit and nut/oat base gets super sticky and can stop up your food processor. My energy bars were made on New Years 2014, my first NYE in the city and the day I ran over the Queensboro bridge. I ate two of them before my run and I had alot of energy! I love these bars; they are whole foods, sweet, filling and you can make alot and keep in the fridge for snacking all week. This recipe is not raw because the oats are not raw but you can make it raw if you use nuts instead of the oats. 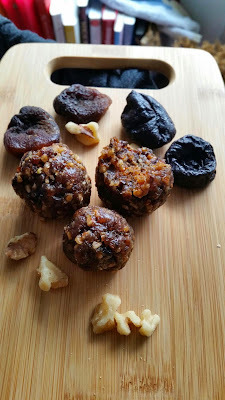 Use three different dried fruits and nuts like I did with my truffles or just use dried fruit and nuts. Get familiar with the raw dessert crust/base because you can use it in everything: pies, cakes, truffles, mini tarts and or just eat it as raw vegan cookie dough. Raw desserts with a nut/dried fruit base are very sweet and gooy so you can win over your non vegan friends with a super yummy dessert. Take a look around my blog for more raw desserts; I have a raw desserts label on the right side of this blog so click on that and it will take you through my different recipes.